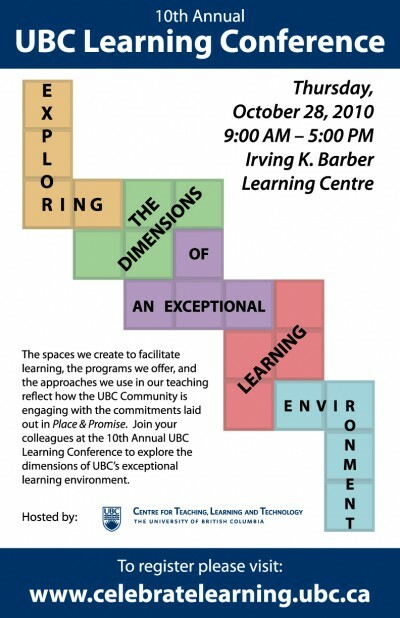 We invite you to the 10th Annual UBC Learning Conference! This year’s theme, “Exploring the Dimensions of an Exceptional Learning Environment,” creates an opportunity to learn how your colleagues across UBC are engaging with aspects of Place & Promise: The UBC Plan. Come prepared for a participatory and dialogue-oriented experience. Sessions will explore how learning spaces impact teaching and learning, innovative curricular approaches to sustainability and aboriginal engagement and the complexities that may arise in diverse & multicultural learning environments. This is a FREE event open to UBC staff, students and faculty. Breakfast and Lunch will be served. A reception will follow.